The Contour is a hugely popular pair of safety glasses and available in four lens types. 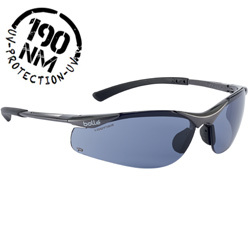 Bolle have managed to get these down to an incredible 21g per pair making them possibly the lightest pair of high quality safety spectacles in the world. Each pair is supplied with a MicroFiber pouch for storage and cleaning. They boast Optical Quality 1 lenses with anti-scratch surface and a non-slip nose bridge including the patented TipGrip arms. 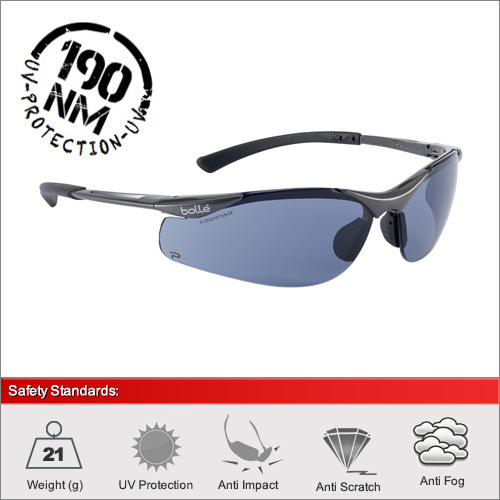 Due to the nature of the special polarised and ESP lens treatments, they are not anti-fog. The Contour protect against UV above and beyond the European Standards. Most glasses will need to protect from UVA and UVB rays which go from 280nm of light. However, Bolle have managed to make the Contour lens protect from 190nm which is well into the UVC range. Very impressive. We have 4 lenses available in this frame. The clear lens for 100% optical quality 1 performance. The ESP lens for reducing harmful blue light and reducing glare. The Smoke lens for direct sunlight and other bright light conditions and finally the special polarised lenses for reducing reflected glare. For a full explanation of the different lens types and their ideal usage please see our dedicated Lens Advice Section.